Hovs Hallar, a restaurant in southern Sweden, was looking for a new way to prevent grease buildup in its exhaust ducts. The solution it found was TurboSwing, which flings grease droplets to the side before they reach the duct. Clanging pans, sizzling meat, cooks calling out orders — everything is perfectly choreographed when the practiced team cooks dinner for up to 200 guests at the Hovs Hallar hotel restaurant in Båstad, a community in southern Sweden. But perfection is the top priority for more than just the kitchen team. The hotel’s director, Waldemar Larsson, sees to it that the hotel’s infrastructure is also always up to date. In the past few years, he has installed an environmentally friendly wastewater system in which the wastewater undergoes plant-based rather than chemical treatment, and he uses renewable energy for heating and hot water. “Top ventilation for top chefs” is Jeven’s slogan. The company was founded in Finland in 1989. Since then, Jeven has become one of the largest suppliers of exhaust solutions for professional kitchens in schools, restaurants and hospitals in Scandinavia. The kitchen specialists develop, produce and sell their products independently and offer their customers a free design service. 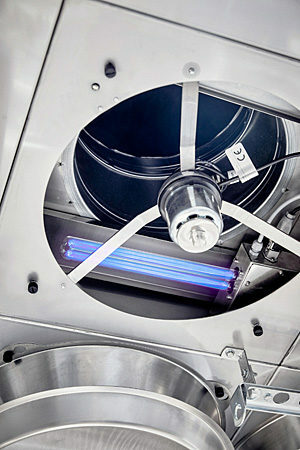 The company’s latest innovation is a UV version of the TurboSwing. It combines mechanical grease separation with UV radiation, removing even smaller droplets and gases through a chemical reaction with the exhaust. Larsson took another step in the modernization of his hotel in 2016 when he set out to improve the kitchen exhaust system. “We worked for a long time with conventional grease separators,” recalls Larsson. “But we always had the problem that grease deposits formed in the exhaust ducts.” Not only did that make extraction of the used air more difficult, it also increased the risk of fire in the exhaust ducts. When Larsson looked for an alternative, he came across the TurboSwing grease ­filter from Jeven. Its mechanical operating principle immediately aroused his interest. The TurboSwing grease filters are placed right on the air intakes above the cooking areas. At their heart is a metal disc with perforations of different sizes. The disc rotates at up to 1,100 revolutions per minute. As a result of the speed and the arrangement of the holes, the disc flings both large and small (down to four microns) grease droplets to the sides, where they accumulate on the walls of the TurboSwing housing and flow through a channel to a collection tray. The tray can be easily and regularly emptied by the cleaning staff. Another special feature of the TurboSwing is that with its mechanical operating principle, the filter features a constant level of grease separation independently of the air pressure over its entire operating range from zero to 60 pascals. That means that a restaurant’s exhaust system can operate outside peak hours at lower output without cleaning the air less efficiently. And since the exhaust is clean, it can be also fed into a waste heat recovery system, which would be impossible with contaminated air. Larsson wanted to see these benefits in action in his hotel, so he had his kitchen converted to work with TurboSwing. “The difference is really unbelievable. There is no more grease buildup in the ducts at all. And the TurboSwing also runs very quietly. The kitchen staff, who stand under the hood for hours on end, really appreciate that.” Since the collection tray is easy to empty, cleaning the exhaust system is considerably easier. There is one more thing that shows how convinced Waldemar Larsson is by the system: He has now installed a TurboSwing at home.